Monsanto No More: Agri-Chemical Giant's Name Dropped In Bayer Acquisition : The Two-Way Germany's Bayer announced in 2016 that it would be buying Monsanto for more than $60 billion. Now it confirms it will be dropping the Monsanto name, which has been made infamous by protesters. A protester takes part in a March Against Monsanto in Paris in May 2016. The European chemical and pharmaceutical giant Bayer is buying Monsanto — and dropping the U.S. company's now-controversial name. These days Monsanto is shorthand for, as NPR's Dan Charles has put it, "lots of things that some people love to hate": Genetically modified crops, which Monsanto invented. Seed patents, which Monsanto has fought to defend. 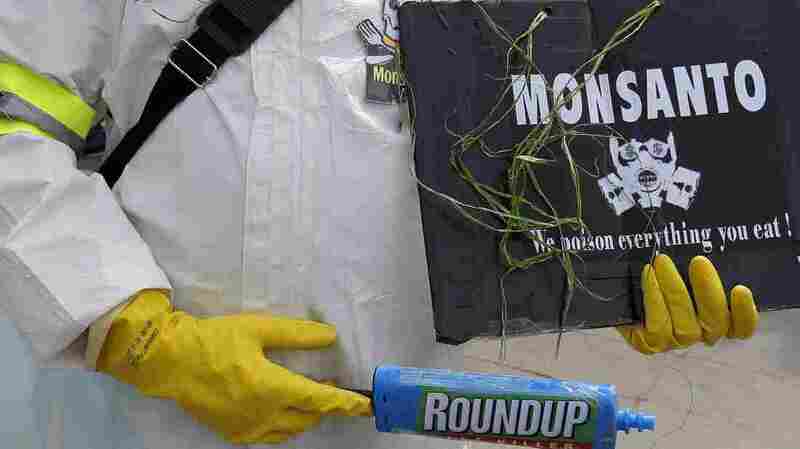 Herbicides such as Monsanto's Roundup, which protesters have sharply criticized for its possible health risks. Big agriculture in general, of which Monsanto was the reviled figurehead. Now, as the merger approaches, Bayer has confirmed what many suspected: In the merger, the politically charged name "Monsanto" will be disappearing. The move is not exactly a surprise — it makes sense that Bayer might want to weed out some of the intense negative associations associated with the Monsanto brand. In a way, it's an indication of how successful anti-Monsanto protesters have been in shaping public perception. In the company's latest statement, Bayer implicitly acknowledged how hostile debates over genetically modified crops and other agricultural products have become. "We aim to deepen our dialogue with society. We will listen to our critics and work together where we find common ground," the chairman of Bayer's board of management, Werner Baumann, said in the statement. "Agriculture is too important to allow ideological differences to bring progress to a standstill. We have to talk to each other. We need to listen to each other. It's the only way to build bridges." NPR's Charles has reported extensively on genetically modified organisms. As he has noted, the political and social impacts of Monsanto's disappearance might reverberate not just in the U.S., but in Europe. In the U.S., one question is whether protesters who have joined "Marches Against Monsanto" will "still march if there's no Monsanto," he says. Meanwhile, in Europe, there has long been broad opposition to genetically modified crops. After Bayer acquires Monsanto, "suddenly, the leading seller of GMOs [will] be European, rather than American," Charles writes. "Would that matter? It's hard to say, but it seems possible." Bayer's acquisition of Monsanto is part of a larger trend of consolidation in the agriculture industry — already dominated by massive corporations. Once the merger is complete, on June 7, one of the world's largest pesticide producers will be combined with the world's largest seed company. By any name, it will be the world's largest seed and ag-chemical company.